« How Charged are my Motorhome/Caravan Batteries? Not sure if your expensive solar panels are doing their job? Here is some simple tests that you can do to determine how your solar panels are performing. A solar panels currency is current (measured in amps) – so you are going to need some method of measuring current. Some solar regulators have a display that will tell you how much current is coming from the solar panels at any point in time (assuming of course that the regulator has been installed correctly and that you trust this reading). If your regulator does not have a “Charge current reading”, you are going to need some other method of measuring this current flow. Option 1 – Clip-on Ammeter. This is by far the simplest and safest method of measuring the current flowing into your batteries from the solar panels. These little meters are able to measure the current flowing through a single wire by simply measuring the magnetic field around that wire. All you have to do is pick the right single wire and clip the meter around it. Note – if you have a pair of wires (going to the solar panel for example) you cannot clip around the pair – the magnetic field generated by the current flowing in the positive wire is cancelled out by the field generated in the negative wire. If you decide to buy one of these great little meters (expect to pay between $90 – $150) – be sure that it will measure DC current as well as AC current – not all do. Option 2 – Standard multimeter. Not difficult or dangerous … if you take care. To measure the current flowing through a wire, you must disconnect that wire and have the current flow through the meter. Effectively putting the multimeter in series with the wire. Make sure your meter is able to measure at least the expected current from the panels. If you have a meter that is rated to 10amps – don’t connect it to a circuit that you expect to see 20amps flowing in. Once the meter is in current mode – NEVER put the probes across the battery. This is the fastest way to destroy the meter. Step 1 – place the multimeter into current mode (high current). This normally involves moving at least one of the probes to a different place on the meter AND selecting the AMPS scale on the selector switch. Step 2 – Carefully disconnect the positive cable that goes from the solar panels to the battery. Step 3 – Place one multimeter probe onto the terminal where the wire came from and the other probe onto the wire. Your meter will now be reading the current flowing from the solar panels to the battery. 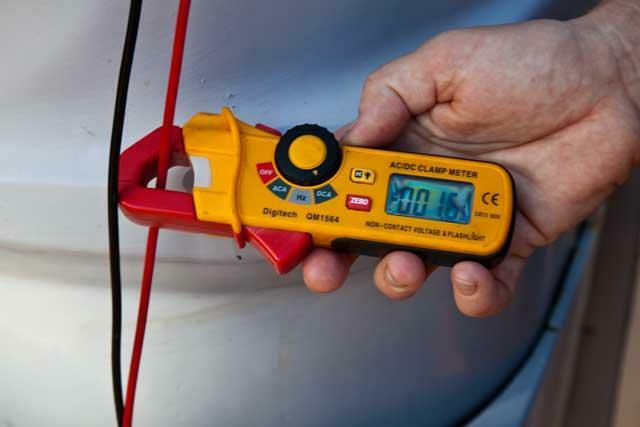 Be very sure to put the meter back into volts mode when you have finished measuring the current. If you have more than one solar panel, you can very quickly check if each of these are working by simply covering them up one at a time. The current measured should drop by approximately the percentage of panels you have covered. (note – if you have a 24v systems and have two 12v panels wired in series to give you 24volts – covering one panel of the pair will stop the other from being effective). Take the total number of watts of all the panels, divide this by 17 – this number is the approximate current you should see charging the batteries at midday on a sunny day. 160 divided by 17 = 9.4amps – thus under ideal conditions you would expect to see around 9.4 amps of charge flowing from the solar panels into the batteries. Take the total number of watts of all the panels, divide this by 34 – this number is the approximate current you should see charging the batteries at midday on a sunny day. 160 divided by 34 = 4.7 amps – thus under ideal conditions you would expect to see around 4.7 amps of charge flowing from the solar panels into the batteries. Remember – these figures are approximate and estimated under ideal conditions. If your system reads something close to these numbers, it is probably working just fine. Do keep in mind that the regulator will reduce the current flowing to the batteries when it perceives that the batteries are full or nearing fully charged. For this reason it is a good idea to discharge the battery bank at least a little before starting these tests. Got a problem with your solar or battery system? Got an electrical or technical question about your motorhome or caravan? I am happy to help and very happy to answer questions. What is a solar regulator and what is its job? This entry was posted on Friday, April 2nd, 2010 at 7:34 pm	and is filed under Caravan, Motorhome, Power, Solar, Technology. You can follow any responses to this entry through the RSS 2.0 feed. You can leave a response, or trackback from your own site. I see some of the advertising on your site. Do you recommend each of these suppliers as reputable people to deal with?? No – the ads that get placed on the site are not within my control. They are there to provide a tiny revenue stream that helps to meet the costs of running the website. We receive a few cents each time an advert is clicked on. Will the clip on ammeter shown above register the amps going out of an appliance or does it only show the battery amps. Thank you, R.W. The clip-on ammeter will show nett current in either direction. Current flowing into the battery will display as a positive reading and current flowing out of the battery will show as a negative (or the other way around if you place the meter on the wire the other way). I have 2 x 80 watt solar panels on my motorhome.they are wired to a controller and then to a bus bar that i also run other appliances from. there is then just one set of heavy duty cable running from the bus bar to the aux battery. is this set up ok?? There is no real issue with the set up you describe. The bus bars should be considered an extension of the battery terminals. The most important aspect is the fusing and the security of the bus bars. Because the bars are connected directly to the battery terminal, a short on the bar has the potential to cause thousands of amps to flow and perhaps explode the battery bank. Be sure that everything feeding from the bus bar is fused correctly. The cables to the solar controller should also be fused. I have three solar panels 64/32/and 80 watt which i will put on the roof of our van all in parrall using a 6mill twin cable down to the solar controler. From the controlre to the two 105 gel batteries in parrell should i connect positive to one battery and negetive to the other battery. Between the batteries and the van should i put a switch so i can turn the power off if needed plus switching from one battery to the other. Hope i make sence to you. From an electrical point of view there is no difference between connecting the positive and negative from the regulator to one battery or the +iv on one the the -iv to the other. Do which ever is easier. Assuming a good quality regulator is present, it is better to leave the solar gear running. This will keep the batteries fully charged and extend their life. All lead acid batteries have a self discharge issue and will eventually result in them becoming discharged even when disconnected. I am running solar panels to a solar controller then on to a 225a/h battery. With a inverter connected to the battery. The solar controller installation diagram shows that the load is connected to the controller??? solar controller has positive and negative from the panels. positive and negative from the battery and pos and neg to the load. 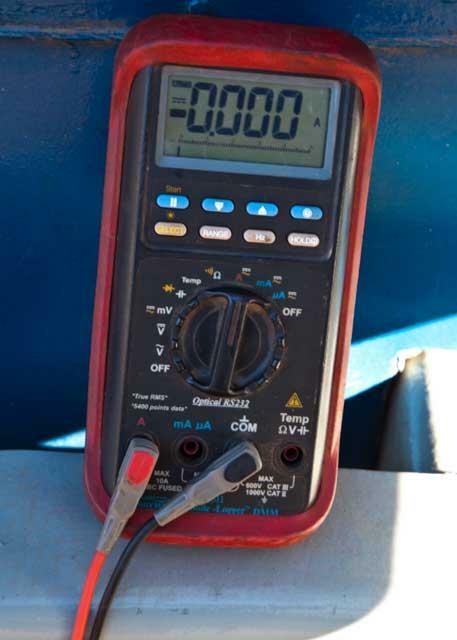 Many solar controllers have a feature called “low voltage load disconnect”, this disconnects a load should the battery voltage ever fall below a given value. To enable this feature the load must be connected via the load terminal on the controller. The other advantage of using this load terminal is that many controllers have a current meter on this terminal. This allows the controller to display the load current and track how many amp hours have been drawn from the battery bank. The load terminals always have a maximum capacity. This normally does not extend to the huge currents that inverters can draw from the battery. Thus it is quite normal to connect the inverter directly (via a fuse or MCB) to the battery. Most inverters have their own low voltage disconnect function. One thing to keep in mind is that unless a shunt is fitted (and the controller is able to accept a shunt input), any load information displayed by the controller will exclude current consumed by the inverter. In short, the setup you describe is quit normal. After reading through your latest articles and with the cost of panels now less than $1 a watt, I have started thinking about upgrading my system as it is seriously under-powered as far as recovery is concerned. The current setup consists of 6 x Unisolar 64w panels, PL20 controller, SEA 2200w inverter and 8 x 6v 235 Ah batteries in series/parallel. I was looking at replacing the unisolar panels with 200/250w panels – depending on roof top real estate – and expect that I would also have to upgrade the controller?? If I find that I can fit the 250w panels onto the roof of the bus without too much modification what capacity controller would I require? Are MPPT controllers worth the extra $$? I need to know if your system is 12v or 24v to calculate the controller size. One thing to be aware of with large panels (200w and above) is the flex in the panels when travelling. Serious thought needs to be put into how they are mounted and supported. There is an article on this site that discusses MPPT controllers. There are some low cost MPPT controllers that support higher array voltages (series panels to 100v+) – I think these have the potential to produce an worthwhile additional charge. The days of the old 64w unisolars are very much over! I moved ours onto the shouse. I have been wandering around on the roof this afternoon measuring to see if I can make them all fit, not a lot of space left with ill-placed vents and a/conds but it should be possible. The current panels are screwed to ‘L’ brackets that are in turn bonded and pop riveted to the top of the bus and running the full length of the panels, with a minimum clearance of approx 80mm near the centre of the roof extending to approx 150mm at the edges. 6 X 250w panels (1500w at 24v) is 62amps (theoretical max) The plasmatronics PL60 will protect its self by reducing the current on the odd occasion that the array produces more than 60amps. The formula for controller size is … total watts decided by system voltage = amps. Eg 1200/24 = 50amps (this is only approximate – to get an accurate figure you need to know the I@PP (current at peak power), V@PP (voltage at peak power) and ISS (short circuit current) of the panels). I would suggest that the 200w panels would be a better option – this is mainly due to the size issues with the 250w panels. They are very likely to break if not supported correctly (more than just around the edges) and are very difficult to handle. They are a far cry from the Unisolar panels that you can throw up to someone standing on the roof. Be sure to upgrade the wiring at the same time. i have 12v 100ah x 2, 250w PV x2 and a Prostar 30 controller. and happened to notice that the negative clip from the controller on the battery has been getting quite warm. That is a lot of PV for just 200ah of battery! That aside, the 41amps produced by the two panels is well in excess of what a 6mm cable will carry. Keep in mind that if it is 6mm from an auto elec – it is really only 4.58mm! 1. overload (as is what is happening in your case). Heat can be calculated in watts using the formula I2R (current squared times the resistance). Either too much resistance (caused by a lose connection or a small wire) OR too much current will cause heating. Heating is not good – firstly it is wasted energy and secondly it can be dangerous. I would be worried about a potential fire. I have a 140 folding panel with a 5m lead to a 120ah agm battery, in the boot of my vw golf. All it runs is a 40l fridge. The car charges the battery when on the move. When the car is charging the battery the indicator on the battery box reads about 14.4v and about 5.6A. However at rest when I have the solar panel attached it reads about 3.6v and about .9 to 1.5A. The controller seems to read about the same on it’s indicator and thats when the battery has been running the fridge for a number of hours, so it couldn’t be full. Do you think there is something wrong with the solar set up? Sorry if this is a silly question, but I know zilch about this. A 140w panel should produce about 10amps maximum under ideal conditions – lets be realistic and say 8amps. 1. The panel is faulty and does not produce its rated wattage when exposed to full sun. 3. The regulator is faulty or incorrectly setup. The best way to test a solar panel is to expose it to full sun, short out the output (without the battery connected of course) and measure the current it produces – it should be close to the ISS (current short circuit) value on the panel name plate. You need a “clip-on” DC meter for this job. To rule out #2 – leave the fridge running over night on the battery – then measure the current from the panel at midday with the panel in full sun. Thanks for the opportunity to ask for your advice. My query is similar to Michaels. Recently when out camping I had my 120 watt panels in full sun on 30 degree days. My 105ah wet battery did not seem to charge. On the MPPT regulator are 2 readings – SOLAR IN and BATTERY. Using a simple Voltmeter, I measured across the + and – terminals of the SOLAR and got a reading of 14.5 V. Across the BATTERY I got 9.6 V, which I also got at the end of the cable at the Andersen plug end. The DC Voltmeter I had connected on the battery also said 9.6 V. The only things running off the battery were an Engel and a LED light at night. The battery charged easily to full when the Genny was running. I have no idea what all this means ! I also don’t understand your instructions to Michael about how to test a solar panel and what to expect. You are reading 14.5v on the solar side of the regulator and just 9.6v on the battery side (or battery terminals). Firstly – if the battery had a voice it would be screaming in pain! At 9.6 volts the battery is being damaged severely each hour it is allowed to remain like this. 1. The regulator is damaged or not functioning – to test this, bypass the regulator and connect the solar directly to the battery and watch the terminal voltage. It should immediately rise. If this is the case there is an issue with either the regulator OR the wiring that was bypassed. Don’t leave the battery connected like this for too long (more than an hour) – the panel will overcharge the battery. 2. The battery is dead – to test this use a 240v charger and charge the battery for 24hrs. Then leave it disconnected (from everything) for 12 hrs. If the terminal voltage is below about 12.5v after 12 hrs, the battery is dead or on its way to the recycle yard. I think that this is unlikely given the voltages you report. It is also possible that the panels are damaged – unlikely – but possible. You will need a DC ammeter to test this. Connect the DC ammeter (10 amp range) and short out the panel via the meter (with the regulator out of the circuit) – the reading on the meter should be close to the ISC written on the back of the panel (ISC = Current Short Circuit). I really appreciate your educational responses. I learn as I read. I doubt the panels or regulator are damaged. I bought the unit new in January 2014 and have only used them twice. I am still doing your first suggestion, but have done the second. I charged the battery to full on my Ctek 7 amp charger and left it on for a couple of days. When I disconnected the charger and left it for 12 hours, the battery registered about 11.5 volts initially, then dropped to 9.6 this morning. When on the charger, it does charge up to full. This does suggest the battery is dead, does it not ? If the battery is dead, is it true that he Solar Panels will not charge them? Hence the reading I got of 9.6 whilst out camping ? From what you say I would be fairly sure the battery has lost a cell and is therefore dead (RIP). Some regulators (but not all) will not charge a damaged battery – they first look at the voltage across the terminals and if it is not within a certain range, they will disconnect. Thanks again Gavin. Yep, the battery is dead !! I tried the Solar Panels on my car battery and they worked fine! So now I am buying a new AGM battery. Hi,I have 120w solar panels with a pwm controller.When testing with a multimeter reads 19 v into regulator and 19v out.i have 2 regulators and the reading is the same with both.Are they both not working. Keep in mind that PWM regulators are simply overcharge prevention switches – they no NOT reduce the output voltage. The behaviour you describe is as expected.